Urmu Gölü quruyor (kuruyor in Turkish) is Azeri for "Lake Urmia is drying up", and the rest of the poster says that there will be a gathering on the 3rd of April. 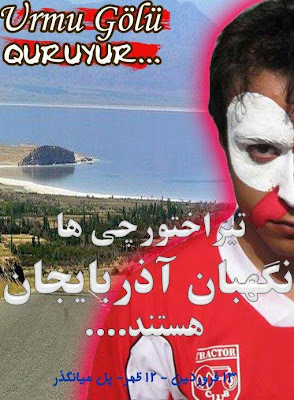 Doing a bit more searching turned up this Facebook group, and a notice that a gathering in Ankara will take place on the 3rd in front of the Azerbaijan Cultural Association (Azerbaycan Kültür Derneği) to raise awareness. Due to being located between Kazakhstan and Uzbekistan it may have made it easy to blame the other side and ignore one's own responsibility (because why should we reduce our water consumption when the other side uses it as much as they want? - as the argument goes) over the past decades, whereas Lake Urmia is located entirely within Iran and its fate depends solely on the actions of a single nation. 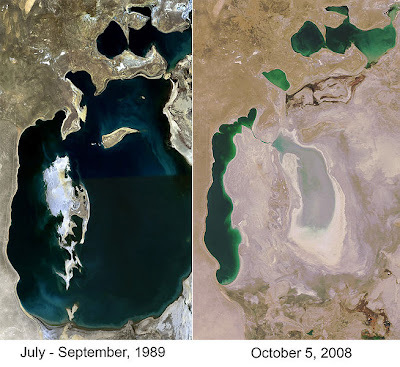 A gif here shows Lake Urmia over a similar period of time, and though there's definite drying it's thankfully not nearly as drastic as the Aral Sea.